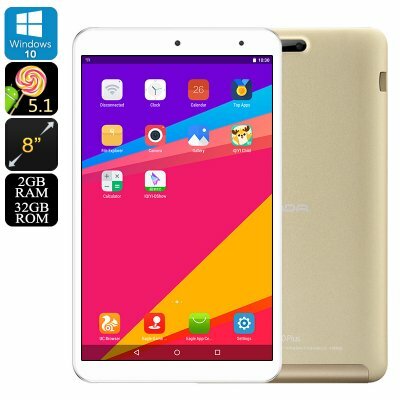 Successfully Added Onda V80 Plus Tablet PC - Windows 10, Android 5.1, OTG, Cherry Trail Z8350 Quad-Core CPU, 2GB RAM, 8-Inch IPS Display to your Shopping Cart. The Onda V80 Plus is a cheap tablet PC that despite its affordable price comes packed with sophisticated hardware. It supports both a Windows 10 and Android 5.1 operating system. This brings along great convenience no matter for what purpose you’ll use this tablet computer. Whether you like to make use of Window’s Office features, or Android entertainment possibilities the Onda V80 Plus supports it all. It comes packed with an epic 4200mAh battery. This cell brings along enough juice to watch a full movie from beginning to end. Additionally, you’ll be able to browse the web and write up files for hours in a row. No matter if you use it for business or entertainment, this Dual-OS tablet PC is sure to meet your demands. On its stunning 8-Inch display, this tablet PC treats you with a breathtaking 1920x1200p resolution. From now on, you’ll be able to enjoy your favorite media to its absolute most. No matter where you’re at, this tablet computer treats you with a cinematic experience from the palm of your hand. Thanks to its IPS technology, you can enjoy vivid colors and sharp images no matter your viewing angle. Your tablet PC comes with 32GB or internal storage and a 64GB SD card slot. This will treat you with all the space needed to securely store all your files and media. The Onda V80 Plus is powered by the Intel Atom Cherry Trail Z8350 CPU. This Quad-Core processor is capable of reaching clock speeds up to 1.92GHz. It brings along a powerful performance while operating in an energy efficient manner. Thanks to this, you’ll be able to tackle demanding software features without overheating your device. With its 2GB of RAM, it even supports multitasking sessions. Whether it’s games, movies, or simply browsing the web - this Dual-OS tablet PC is sure to handle it all. To increase your overall experience even further, it supports OTG. This feature allows you to hook up external hardware devices such as a hard-disk or game controller to your tablet PC. This tablet PC comes with a 12 months warranty, brought to you by the leader in electronic devices as well as wholesale electronic gadgets..